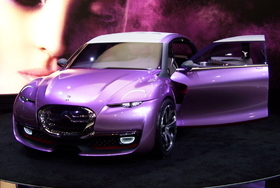 The Citroen Revolte is a plug-in electric concept with a range-extending engine. FRANKFURT -- Citroen has spent years hearing the same question: When will you launch a new version of its beloved 2CV? That answer remains unknown, but in the Revolte concept Citroen gives a glimpse of how it thinks a 21st-century version of the 2CV could look. "The Revolte is a bridge between the past and the future," Citroen Executive Vice President Frederic Banzet said during the car's launch at the Frankfurt auto show. The styling of the Revolte is inspired by the 2CV, which was built from 1948 to 1990. Citroen sold more than 5 million 2CVs over the car's 42-year production run. The Revolte has rear-hinged doors to provide easy access to the three-seat cabin, which has an interior that Citroen says resembles a box of make-up. Much like the similar-named Volt from Chevrolet, the Revolte is a plug-in electric car with a small, range-extending combustion engine. The car is 3.68 meters (12 feet, 1 inch) long, 1.73 (5 feet, 7 inches) meters wide and 1.35 meters (4 feet, 4 inches) tall.